Recycling of Polyurethane Foams introduces the main degradation/depolymerization processes and pathways of polyurethane foam materials, focusing on industrial case studies and academic reviews from recent research and development projects. The book can aid practitioners in understanding the basis of polymer degradation and its relationship with industrial processes, which can be of substantial value to industrial complexes the world over. The main pathways of polymer recycling via different routes and industrial schemes are detailed, covering all current techniques, including regrinding, rebinding, adhesive pressing and compression moulding of recovered PU materials that are then compared with depolymerization approaches. 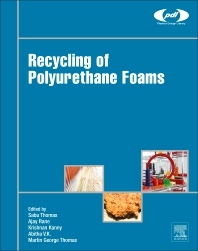 The book examines life cycle assessment and cost analysis associated with polyurethane foams waste management, showing the potential of various techniques. This book will help academics and researchers identify and improve on current depolymerization processes, and it will help industry sustainability professionals choose the appropriate approach for their own waste management systems, thus minimizing the costs and environmental impact of their PU-based end products. Professor Thomas is currently Pro-Vice Chancellor of Mahatma Gandhi University and the Founder Director and Professor of the International and Interuniversity Centre for Nanoscience and Nanotechnology. He is also a full professor of Polymer Science and Engineering at the School of Chemical Sciences of Mahatma Gandhi University, Kottayam, Kerala, India. Prof. Thomas is an outstanding leader with sustained international acclaims for his work in Nanoscience, Polymer Science and Engineering, Polymer Nanocomposites, Elastomers, Polymer Blends, Interpenetrating Polymer Networks, Polymer Membranes, Green Composites and Nanocomposites, Nanomedicine and Green Nanotechnology. Dr. Thomas’s ground-breaking inventions in polymer nanocomposites, polymer blends, green bionanotechnological and nano-biomedical sciences, have made transformative differences in the development of new materials for automotive, space, housing and biomedical fields. In collaboration with India’s premier tyre company, Apollo Tyres, Professor Thomas’s group invented new high performance barrier rubber nanocomposite membranes for inner tubes and inner liners for tyres. Professor Thomas has received a number of national and international awards which include: Fellowship of the Royal Society of Chemistry, London FRSC, Distinguished Professorship from Josef Stefan Institute, Slovenia, MRSI medal, Nano Tech Medal, CRSI medal, Distinguished Faculty Award, Dr. APJ Abdul Kalam Award for Scientific Excellence – 2016, Mahatma Gandhi University- Award for Outstanding Contribution –Nov. 2016, Lifetime Achievement Award of the Malaysian Polymer Group, Indian Nano Biologists award 2017and Sukumar Maithy Award for the best polymer researcher in the country. He is in the list of most productive researchers in India and holds a position of No.5. Recently, because of the outstanding contributions to the field of Nanoscience and Polymer Science and Engineering, Prof. Thomas has been conferred Honoris Causa (DSc) Doctorate by the University of South Brittany, Lorient, France and University of Lorraine, Nancy, France. Very recently, Prof. Thomas has been awarded Senior Fulbright Fellowship to visit 20 Universities in the US and most productive faculty award in the domain Materials Sciences. Professor Thomas has published over 800 peer reviewed research papers, reviews and book chapters. He has co-edited 80 books published by different publishers. He is the inventor of 6 patents and has delivered over 300 Plenary/Inaugural and Invited lectures in national/international meetings over 30 countries. He has established a state of the art laboratory at Mahatma Gandhi University in the area of Polymer Science and Engineering and Nanoscience and Nanotechnology through external funding from DST, CSIR, TWAS, UGC, DBT, DRDO, AICTE, ISRO, DIT, TWAS, KSCSTE, BRNS, UGC-DAE, Du Pont, USA, General Cables, USA, Surface Treat Czech Republic, MRF Tyres and Apollo Tyres. Ajay Vasudeo Rane is a Doctoral Research Fellow at the Durban University of Technology, South Africa. His research focuses include polymer blends, ageing and degradation of polymeric materials, green chemistry, and polymer recycling. Krishnan Kanny is a Professor of Material Science and Engineering at the Durban University of Technology, South Africa. He is a seasoned engineer and scientist with over twenty years research experience in advanced engineering materials systems, and more than 120 papers in international journals and conference proceedings. Abitha V K is a Senior Research Fellow at the School of Chemical Sciences, Mahatma Gandhi University, India. Within the field of polymer science, her research interests include polymer blends, ageing and degradation of polymeric materials, green chemistry, and polymer recycling. Martin George Thomas is a research student at the International and Interuniversity Centre for Nanoscience and Nanotechnology, Kottayam, Kerala, currently performing research into the areas of epoxy nanocomposites.